Blowing Dust. Small particles such as sand, dirt, sawdust, or other grit. Can be blown into the eye on a windy day. Eyelash. An eyelash is a common finding. Dry Mucus. A loose piece of dried mucus (sleep) can feel like something is in the eye. Sharp Object (Serious). A piece of glass from a shattered glass ornament is an example. High Speed Objects (Serious) such as a metal chip from a hammer or lawnmower. A plastic fragment or small rock thrown from a weed-wacker are other examples. Minor object or small particles in the eye (such as an eyelash or dirt). Reason: most likely can be removed at home. The object (or particles) will always stay in the front part of the eye. Some parents worry that it can get lost behind the eyeball. This will not happen. 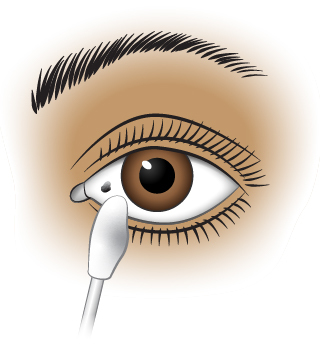 The space beyond the eyelids goes back ¼ inch (6 mm) and then stops. In other words, it's a dead end. Clean around the eye and face with a wet washcloth first. Reason: So more particles won't get in. Put that side of the face in a pan of warm water. Have your child try to open and close the eye while in the water. Do it several times. For younger children, fill a glass or pitcher with warm tap water. 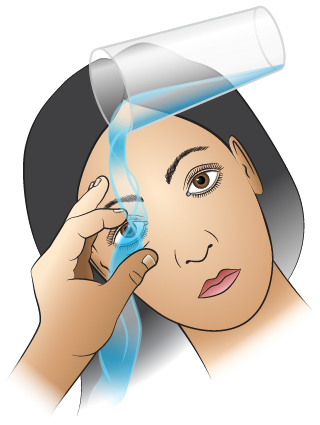 Pour the water into the eye while holding your child face up. The eyelids must be held open during the rinsing. This process often needs the help of another person. Try to get it out. Use a moistened cotton swab or the corner of a moistened cloth. Pull the lower lid out by pulling down on the skin above the cheekbone. Touch the particle with a moistened cotton swab. If that doesn't work, try pouring water on the particle. Do this while holding the lid out. If the particle can't be seen, it's probably under the upper lid. This is the most common hiding place. Try having your child open and close the eye several times while it is submerged in a pan or bowl of water. If you have an eye cup, use it. If this fails, pull the upper lid out. Then, draw it over the lower lid while the eye is closed. When the eye is opened, the particle may come out. The lower lid may sweep the particle out from under the upper lid. Children who wear contact lenses need to switch to glasses for a while. Reason: To prevent damage to the cornea. The pain, redness and tearing usually pass after the object is removed. It may take 1 to 2 hours for these symptoms to fully go away. Clean around the eye with a wet washcloth first. Place the face under a gently running faucet or a shower. 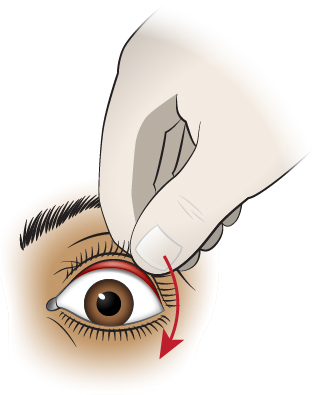 Hold the eyelid open while you do this. Or, try to open and close the eye repeatedly while holding that side of the face under water in a pan or bowl (of water). Try to get the particle out with a moistened cotton swab or the corner of a moistened cloth. If this does not work, then place the face under a gently running faucet or a shower. Hold the eyelids open while you do this. This should flush the particle out. Pull the lower eyelid out by gently pulling down the skin above the cheekbone. 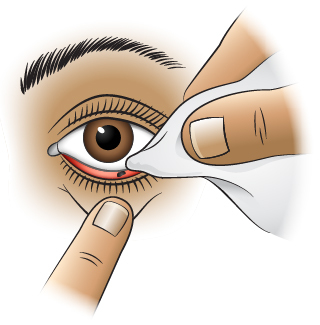 If that does not work, try pouring water on the speck while pulling the lower eyelid out. If particle cannot be seen, it's probably under the upper lid, the most common hiding place. Try to open and close the eye several times while it is submerged in a pan or bowl of water. If this fails, pull the upper lid out and draw it over the lower lid. This action, and your tears, will sometimes dislodge the particle.